Trained as an operatic soprano, Lindsay Sutherland Boal began her career on Canadian and international stages singing the roles of the Countess in La Nozze di Figaro, Papagena in Die Zauberflöte, Zerbinetta in Ariadne auf Naxos and Madame Silkberklang in Die Schauspieldirektor. A two-time regional finalist of the Metropolitan Opera National Council Auditions, she also performed extensively in operetta and musical theatre, and as a concert soprano with the Winnipeg Symphony Orchestra, the Nova Scotia Symphony Orchestra, the Rainer Hersh Symphony Orchestra in the U.K. and the Vancouver Art Gallery Concert Series. Following several successful cabaret performances, Boal changed her focus from traditional operatic repertoire to music from the Weimar Republic. This led to the creation of her first self-produced project: a one-woman, critically-acclaimed and award-winning show entitled Purely Cabaret. Subsequenty she earned an invitation to perform the work at the International Cabaret Conference at Yale University, where she was broadcasted internationally on National Public Radio and Voice of America. 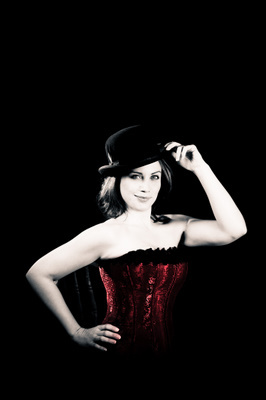 In 2011 she headlined A Little Nostalgia Cabaret with Against the Grain Theatre, singing the works of Kurt Weill as well as other cabaret favourites. Boal recently returned to the operatic repertoire to sing the role of Musetta for two sold-out productions of Against the Grain Theatre’s La Bohème. You can read more at www.lsblive.com. This week Boal will make another appearance with Against the Grain Theatre in a concert presentation entitled The Seven Deadly Sins (and holier fare). I ask Boal ten questions: five about herself and five about Seven Deadly Sins (and holier fare). Lindsay Sutherland Boal, who looks like her mother. I am the spitting image of my mother but I have my dad’s feet. I am 4th generation Canadian but before that my great-grandmother hailed from Wales and my great- grandfather England. 2) what is the BEST thing / worst thing about being a cabaret chanteuse? There are so many “best things” about being a cabaret singer. I love the intimate nature of the cabaret setting. The audience is so close; it’s casual; I often feel like I’m having a conversation with my audience. I also find that I can express things through lyrics that I, for whatever reason, don’t have the courage to say in my daily life – I can safely hide behind a great line. I haven’t discovered a “worst thing” yet, which must be a good sign! I listen to all kinds of things… it depends on my mood. Eartha Kitt, Julie Wilson, Ute Lemper, Margaret Whiting are my favourites from the cabaret type world. I love the way Jean Stillwell uses text. I love the way Ute Lemper uses her body. I love watching Bernadette Peters talk to an audience. From the classical world I love Renee Fleming and Anna Moffo. I could listen to David Pettsinger sing the phone book. There are quite a few!! I would love to speak every language of the world. I would love to be able to reach the full expression of standing bow pulling pose in my Bikram Yoga series… I wonder if I’ll ever be able to do the standing splits! I would also love to know how to apply the perfect “smokey eye”. 5) When you’re just relaxing (and not working) what is your favorite thing to do? I love to practice yoga; I love to share a fabulous red wine and fabulous conversation with my fabulous friends; I love to be with my two nieces and I also love to bake bread… my best is a cranberry pecan loaf. 1) how does Seven Deadly Sins challenge you? The choreography – there is more than just blocking!! Also, we’re performing this in German (with English surtitles). While I spent a bit of time in Germany and have studied the language at some length, I was not able to understand the libretto in its entirety at first sight… so I’ve had to brush up on my German to effectively communicate the text. 2) what do you love about Seven Deadly Sins and this type of music theatre? Brecht and Weill, in 1928 when they were rehearsing Die Dreigroschenoper. I am a HUGE Brecht/Weill enthusiast. I love the fruits of all of their collaborations. I love the sound of Weill’s German works. But what particularly interests me about 7DS is the zeitgeist that was the 1933 premiere, both politically and within the relationships of the cast. 3) Do you have a favorite song or moment in the show? Yes – from the first note to the last note. But seriously, I love the play out of Habsucht (Covetousness), the gorgeous melodies in Unzucht (Lust) and the intensity of Neid (Envy). 4) how do you relate to Seven Deadly Sins as a modern woman? I think everyone can relate to 7DS as a man or woman living today, 50 years ago, or 50 years in the future. We all face circumstances that lead us to question two sides of an id/superego coin. What should I do versus what do I want to do? What can I get away with and what can I not live with myself knowing? I’ve been very fortunate to have had so many amazing people come into my life. Tracy Dahl and Jean Stilwell in the classical world have been very influential, as have Pam Meyers, Tex Arnold, and Julie Wilson from the cabaret world. This entry was posted in Interviews, Opera and tagged Benjamin Britten, Christopher Mokrzewski, Joel Ivany, John Adams, Kurt Weill, Lindsay Sutherland Boal, Matjash Mrozewski, Steve Reich. Bookmark the permalink.